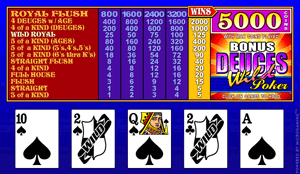 Bonus Deuces Wild Poker is played with one standard deck of 52 playing cards that is shuffled before each game. However, the Deuces in the deck are wild and substitute for cards of any denomination and suit to complete a winning hand. The Deuces are cards with a value of 2. Whenever you are dealt a Deuce, it is automatically assigned a denomination and suit. This gives you the highest possible payout for the cards you are holding. The maximum payout in Bonus Deuces Wild Poker is 5,000 coins.